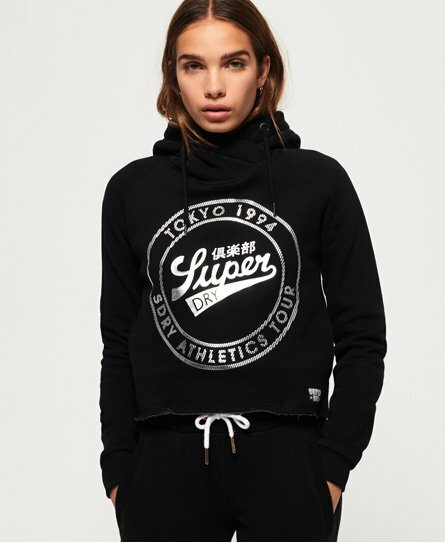 Superdry women's Ace metallic crop hoodie. This hoodie offers effortless style and comfort, featuring a Superdry graphic across the front in a metallic print, a cross over hood with drawstring adjusters and a Superdry logo tab above the hem. The Ace metallic crop hoodie has been designed with an unfinished hem for a stylish twist and features Superdry taping in the hood, and ribbed cuffs for a flattering fit. Team this hoodie with your favourite joggers and trainers for a statement outfit.